For many women, the value of a great party dress is undeniable. How to pick a fabulous dress for parties? Woman dress picker will answer your questions and solve your problems finally. Many women may encounter such a problem, when they got an invitation to the season's hottest party: they have nothing to wear which of course gives them a bad mood. No worries, this passage will help you solve this headache problem and present yourself a stunning you in parties. To quickly find a fabulous party dress, you can use fashion design program to pick your favorite party dress ASAP. There are massive women dresses symbols in the tool. 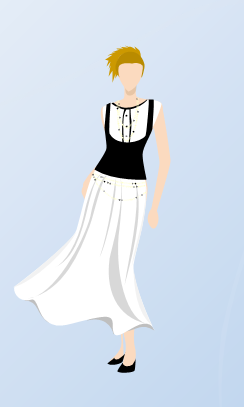 Drag and drop one dress you like, and change its color to find the color that best suits you. Or you can mix and match different clothes as you like. How formal is the gathering you are attending? If you are attending an upscale dinner party, you should stick with a more conventional cut and avoid a dress that falls above the knees. For more informal parties, fashionable cuts that show a bit more skin are perfectly acceptable but should remain tasteful. A cocktail party dress in a conservative style works well for both. Consider what colors accent your best features. There are many online sites that give color recommendations based on skin tone, hair and eye coloring. You can also ask your friends and family which color you look best in. For example, if you have brown or olive-colored skin with darker hair and eyes, jewel-toned dresses will look great on you. Lean towards deep, rich purples, pinks and golds for your party dress. If you have ivory or beige-colored skin, choose a formal party dress that brings out the undertones in your skin. A royal blue or teal shade can accent skin with bluish undertones while skin with pink and red undertones looks lovely with peach colors. While a dress might be cheap and in a cut and color that you like, a low-quality fabric is always noticeable. Spend the extra cash to buy quality materials, and your party dress will look nicer on your body and to the discerning eye. Also, pick fabric that will minimize any problem areas and accentuate your curves. Jersey and knit fabrics can cling to your body and make you look bigger than you are, depending on the style. These can also make the dress look more casual and are not appropriate for formal party dresses. The key to a good cocktail party dress that will last you through multiple wears is to choose a style, cut and color that complement your body, features and skin tone. Empire waists and A-line styles are flattering on most body shapes, and ball-gown cuts are stylish as well. If you have own idea about what really suits you, you may try to use fashion design software to design your own clothes. Open Edraw Max, point to New, then point to "Fashion Design". 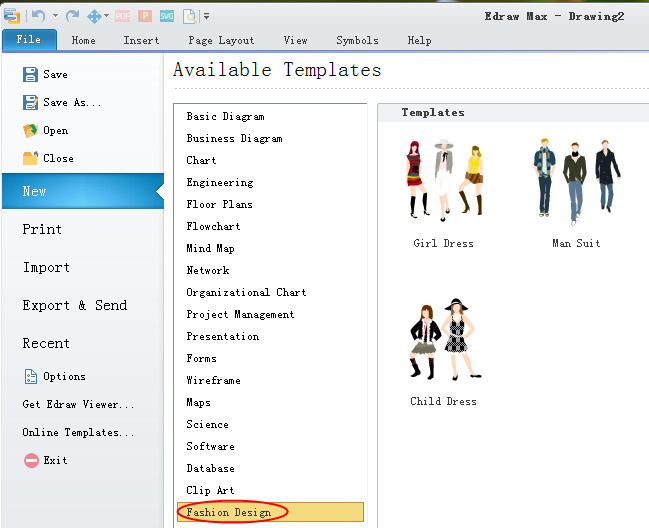 Double click the "Girl Dress" from Templates on the right side of the software to start the drawing page. 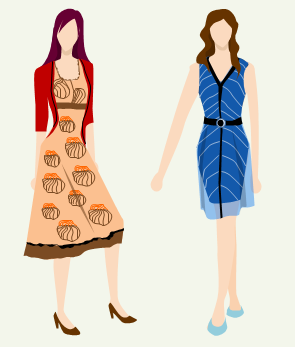 On the left side of the drawing page, you can find "models" and eight categories of girl dress symbols. Then you can drag and drop one model on the drawing page and add clothes you like to it. Use you imagination to design the clothes you want.